Using this form, the student fills out thoroughly confidential questionnaire. Their instructor will use the information provided solely to access their satisfaction while continuation of course. The information will include their attendance, the best aspects of the course and any additional comments. It will also include whether they can see any aspects which need improvement. Each parent should use only one form for each school year. In order to discuss a serious problem or event occurring in the child’s classroom, the parent should directly talk with the teacher instead of using this form for the same. 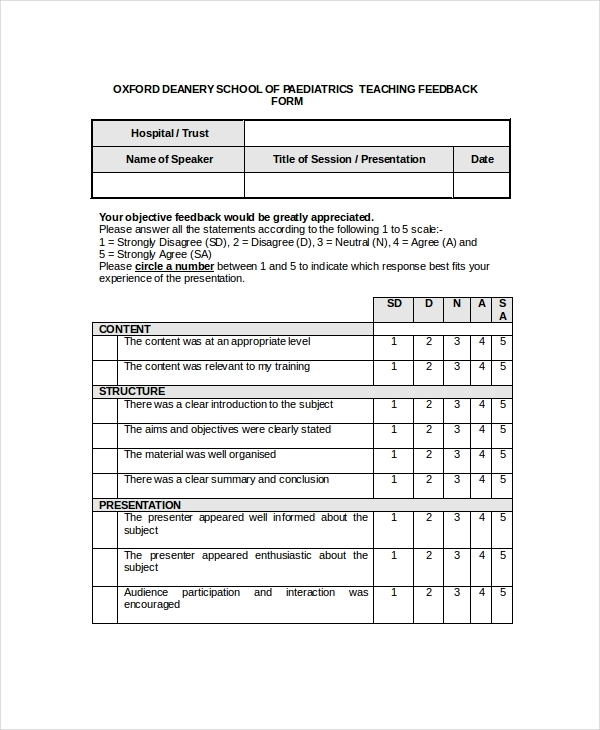 This form should be used by the parents to discuss about the student’s performance. 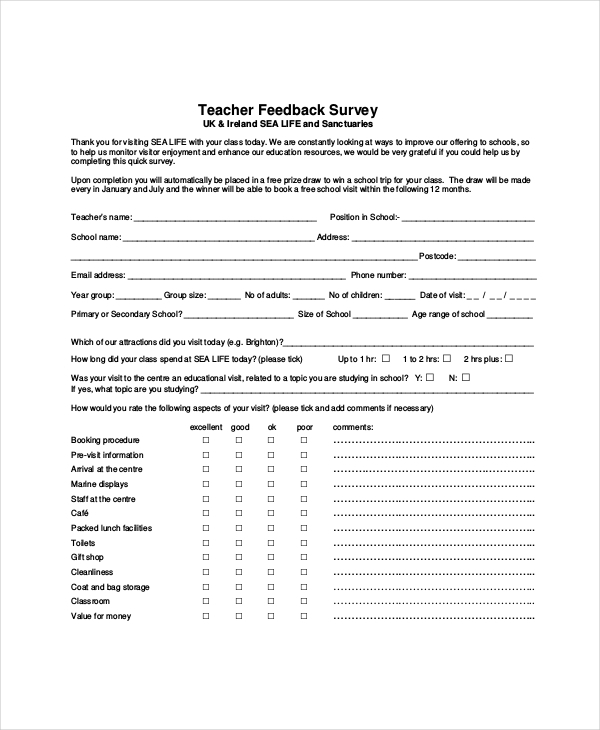 This form is very important as teachers get feedback of the students about their teaching on the end of the semester course. It can immensely help to refine improve their teaching. It adds extra benefit as it allows their students to discuss their problems when there still time to make appropriate changes in the semester. Using this form, the student illustrates whether their teacher demonstrates knowledge and is well-prepared for each of their class. They can also analyze whether he/she has completed the whole available course and provided them with extra material apart from the textbook. They can also find whether their teacher communicates and discusses the subject matter effectively. 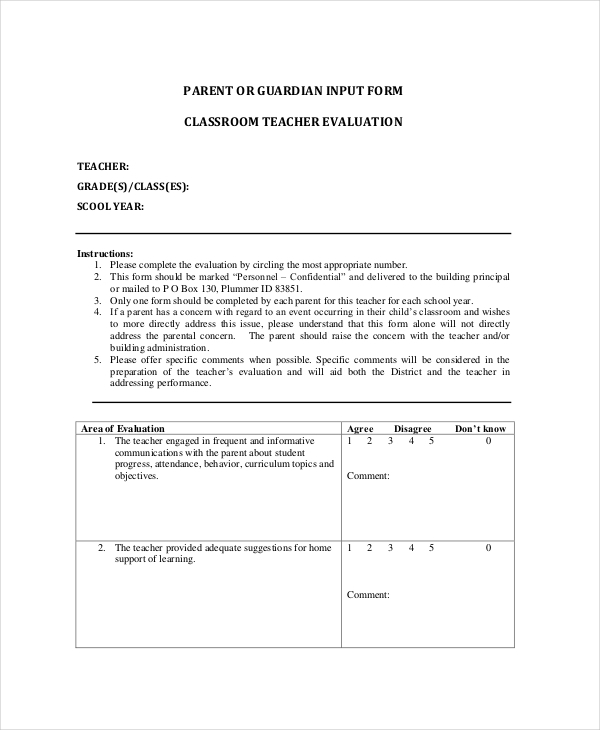 Using this form, the students can illustrate whether their teacher provide safe environment can arrange the classroom in order to maximize their learning. They can also evaluate whether their teachers forms clear expectations for classroom rules from the students. They can also check whether their teacher maximizes instructional time while minimizing disruptions from any student. Using this form, the teacher is state whether they are able to get required resources to teach at the school. They can further state that whether they feel safe while teaching at school. They can also illustrate whether they are pressurized by the students or their parents to increase their marks in a particular way. Using this form, the person can illustrate whether the content was relevant and was at proper level. They can further analyze whether the aims and objectives of the presentation where clearly stated and well-organized and whether it provided clear summary and conclusion. They can further analyze whether the presenter was well-informed about the discussed subject. 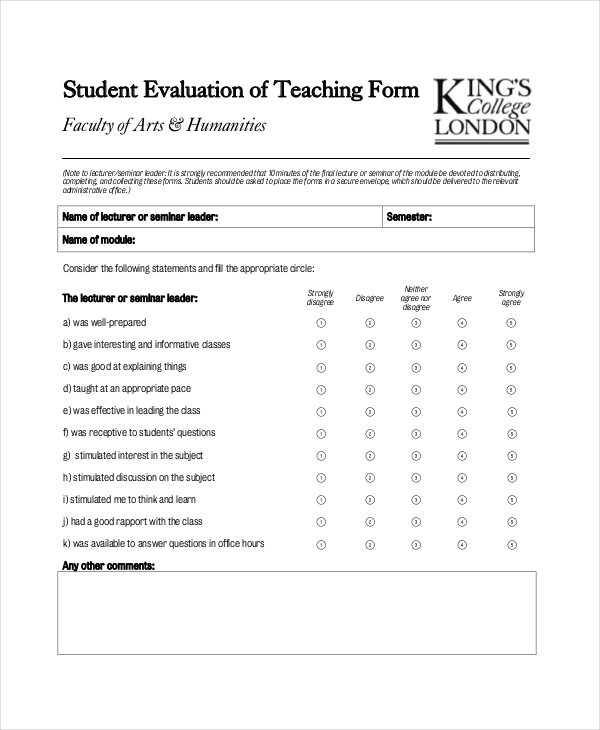 Using this form, the students can illustrate whether the tutorials covered important ideas and areas and whether those tutorials well linked with the provided lectures. They can further state whether the tutorial were well planned, structured and encouraging for students to prepare properly. They can also state whether the teacher helped them to contribute and participate. 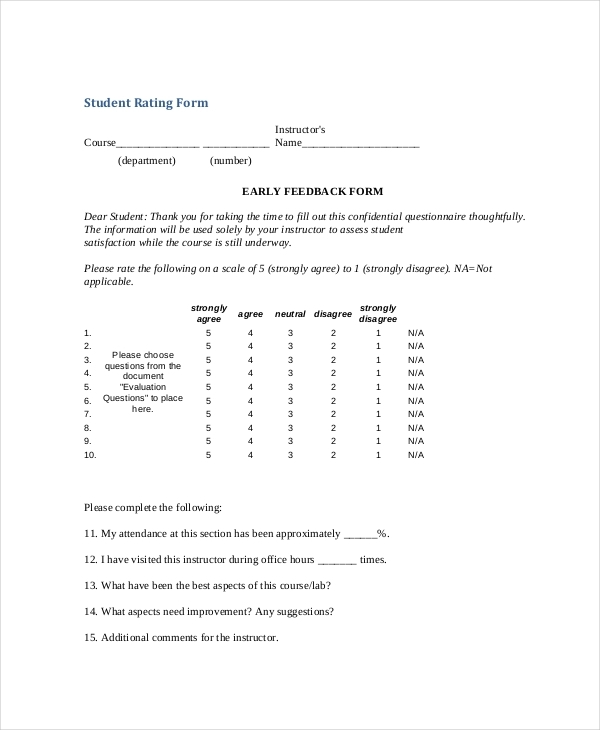 This form is used to seek a feedback from the students in order to strengthen and improve the quality of teaching and learning environment. It is also used to look for opportunities to refine teacher’s performance in making students interested in the classroom engagement. It helps them improve the way of discussing with their students in order to bring excellence in the teaching and learning process. This form also provides the students the opportunity to discuss whether the teacher complete full syllabus suggested by the university or not. It is important as several teachers don’t. It even gives the option to discuss whether they cover relevant topics which are beyond syllabus. This may give satisfaction and confidence to the teachers who do, while encouraging the teachers who don’t. Using this form, the students can easily make their teacher know that what they like most and least in their class. It is vital as they can discuss anything they feel appropriate and which they can’t usually discuss out of fear. They are also able to discuss the best qualities of their teacher and how can he/she become best in their profession. They are able to discuss what they have learnt from the course. They can include any additional comment in another sheet. The students can evaluate whether the teacher communicates clearly and covers entire syllabus by discussing the topics in detail. They can also check if their teachers possess deep knowledge about the subject he/she is teaching. 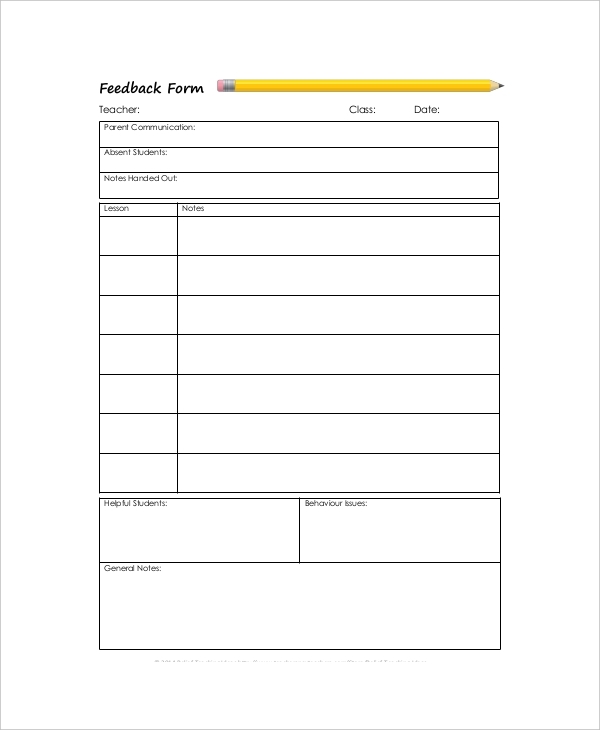 Using this form, the students can illustrate that whether periodical assessments where held as per plan. They can freely discuss whether their teacher encourages teaching techniques like quiz, assignments, seminars, presentations, etc. They can further discuss the most important thing which the behavior and attitude of the teacher towards their students. One can also find out if their teacher is unfair and biased towards some students. Hence, the feedback is extremely valuable to them as it influence their teaching technique in future. Many teachers wish to become role model for their students. The students can also discuss about their school library. They can evaluate how often they visit the library and are their subject book available there. Using this form, the students can evaluate the cooperativeness and helpfulness of the library and net centre staff and whether they provide them the Xerox facility. They can also find whether are able to access Internet centre when needed and whether they can use online educational resources. They can illustrate about their satisfaction with the book arrangement and reading space over there. The students can also evaluate using this form whether the toilets and class rooms are properly cleaned. They can also illustrate whether they are offered enough drinking water and whether they are satisfied with the food served in the canteen. They can also illustrate whether they are provided with proper quantity of chemical for their lab activities. 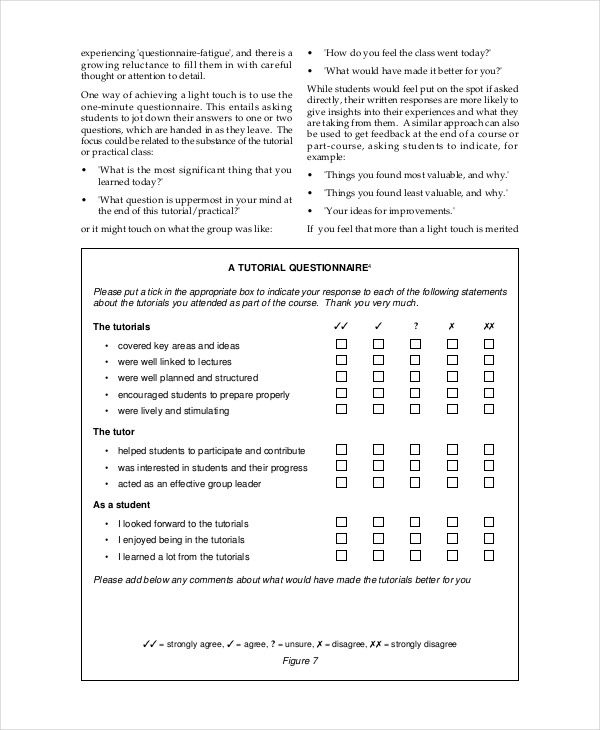 Using this form, the students can discuss whether their teacher arrives and leaves on time and whether they maintain environment which is conducive for their learning. They can also illustrate whether the teacher is fair in examination hall and checking process. It can be used by parents or students in a number of occasions.